In 1996, Harrop strengthened its commitment to serving the electronic ceramics industry with the acquisition of the A. J. Carsten Co. 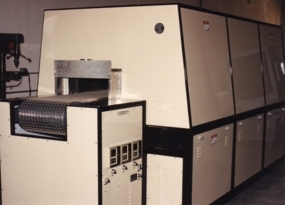 Since the early 1970’s, A. J. Carsten has been a pioneer in designing and supplying continuous forming equipment for manufacturing thin-film ceramic tape. After working intimately with the founders in Powell River, BC for several years after the purchase, Harrop subsequently integrated the Carsten technology and know-how into Harrop’s home operations at Columbus, Ohio in 2004. The renowned Carsten line of tape casters and burnout ovens, in conjunction with Harrop’s well-respected line of high temperature kilns, offer an unmatched combination of processing equipment for ceramic tape producers. Traditionally, ceramic tape casting applications have included multi-layer ceramic capacitors, semiconductor substrates, piezoelectrics, and ferrites. Recently, emerging materials technologies and nanotechnologies have given rise to both thin and thick film tape casting applications for fuelcell elements, battery components and polymer membranes. The Laboratory Bench Caster is a small, table-top model designed as a low-cost alternative to large volume production tape casters. This model is ideally suited for R&D projects, quality control measurements, and prototype manufacturing. The unit is capable of continuously tape casting up to 6 inches wide and 5 feet long with varying thicknesses and at a controlled casting speed. Typically, the casting surface is a glass plate, but the unit can be readily outfitted with different casting surfaces required for the application. The endless tape casting belt is a welded, polished carbon steel belt driven by a controlled frequency motor for precise adjustment of the casting speed. Custom-designed systems are available. Units come equipped with a precision doctor blade assembly to adjust the wet tape thickness, independent drying zone controls, razor stripper, and paper roll take-up assembly for dried tape. Temperature capability up to 450°C is available. All units include a 4 foot entrance loading station and a 4 foot exit unloading station. A closed loop return system is available as well. Call Harrop Industries at 614-231-3621 for custom tape casting systems.